2’3’-cGAMP VacciGrade™ is a preclinical grade preparation of the cyclic dinucleotide 2’3’-cGAMP (cyclic [G(2’,5’)pA(3’,5’)p]), a cyclic dinucleotide (CDN) produced in mammalian cells by cGAS (cGAMP synthase) in response to double-stranded DNA in the cytoplasm. 2’3’-cGAMP is also referred to as “noncanonical” cGAMP due to the presence of the atypical 2’-5’ phosphodiester linkage between the guanosine and the adenosine. 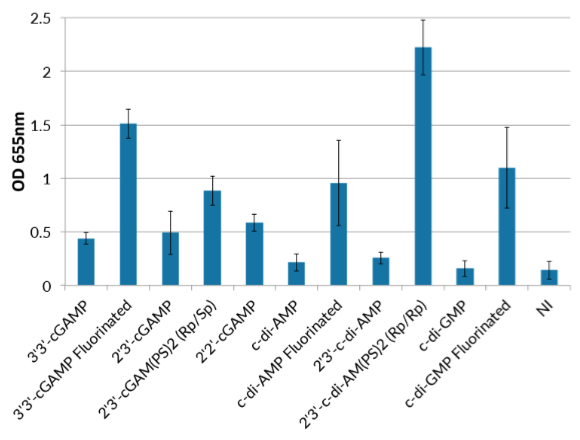 Structural and functional studies revealed that noncanonical 2’3’-cGAMP is distinct from the canonical 3’3’-cGAMP produced by bacteria [1, 2]. CDNs are a relatively new class of adjuvants that have been shown to increase vaccine potency . CDNs activate innate immunity by directly binding the endoplasmic reticulum-resident receptor STING (stimulator of interferon genes), leading to the expression of interferon-β (IFN-β) and nuclear factor-κB (NF-κB) dependent inflammatory cytokines. 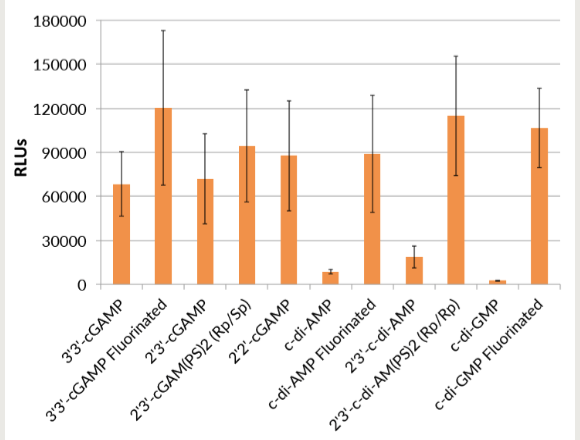 2′3′-cGAMP is an effective adjuvant that boosts the production of antigen-specific antibodies and T cell responses in mice . 1. Diner E. et al., 2013. The Innate Immune DNA Sensor cGAS Produces a Noncanonical Cyclic Dinucleotide that Activates Human STING. Cell Rep. 3(5):1355-61. 2. Gao P. et al., 2013. Cyclic [G(2',5')pA(3',5')p] is the metazoan second messenger produced by DNA-activated cyclic GMP-AMP synthase. Cell. 153(5):1094-107. 3. Dubensky TW. et al., 2013. Rationale, progress and development of vaccines utilizing STING-activating cyclic dinucleotide adjuvants. Therapeutic Advances in Vaccines 1(4): 131-143. 4. Li XD. et al., 2013. Pivotal roles of cGAS-cGAMP signaling in antiviral defense and immune adjuvant effects. Science. 341(6152):1390-4. 2’3’-cGAMP VacciGrade™should be stored at -20°C. Intracellular Nucleic Acid Sensing Triggers Necroptosis through Synergistic Type I IFN and TNF Signaling. 2018 Cell Host Microbe 23(3):297-301. The Common R71H-G230A-R293Q Human TMEM173 Is a Null Allele. The mucosal adjuvant cyclic di-GMP enhances antigen uptake and selectively activates pinocytosis-efficient cells in vivo. Blaauboer SM, Mansouri S, Tucker HR, Wang HL, Gabrielle VD, Jin L.